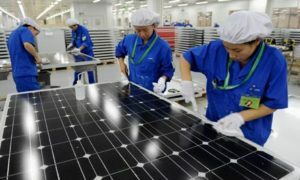 WASHINGTON — China may come back to solar power, recently pledging more government aid for the failing solar power industry. Reuters reported that the solar power sector has been struggling after there were too many firms and companies, far few demand and even lower prices. The country’s cabinet, the State Council, said that they wanted to quadruple power generating capacity back in July 2013. Now, they said they want to help “promote the healthy development” of the industry. They are looking to merge struggling companies and promote a baseline for standardization throughout the solar power companies, among other guidelines.